This week, Admiralty Shipyards—a Russian defense company— held a ceremonial launching for its newest Varshavyanka-class diesel-electric submarines. 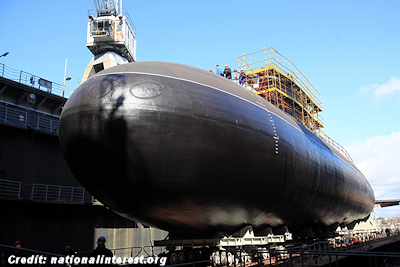 Dubbed the Krasnodar, the vessel is the fourth of a planned six upgraded Kilo-class subs Russia is constructing under Project 636.3.
ccording to the company’s website, the commander of Russia's Navy, Viktor Chirkov, attended the ceremony, which was held in St. Petersburg on Saturday. Previously, Russian state media outlets have said that the Varshavyanka-class are the “quietest in the world, and so was dubbed ‘black hole’ by NATO.” . . .